This infrared image of Malakas' cloud temperatures was captured on Sept. 23 at 0405 UTC (12:05 a.m. EDT) by the AIRS instrument on NASA's Aqua satellite. 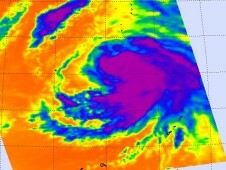 The image shows a very large area of highest, coldest cloud tops (colder than -63 Fahrenheit) throughout Tropical Storm Malakas (in purple). Credit: NASA/JPL, Ed Olsen NASA's Aqua satellite has peered into the cloud tops of Tropical Storm Malakas and derived just how cold they really are, giving an indication to forecasters of the strength of the storm. When the Aqua satellite passed over Malakas from space on Sept. 23 at 0405 UTC (12:05 a.m. EDT) the AIRS instrument took the temperature of the cloud tops in the storm and found them to be as cold as or colder than -63 Fahrenheit throughout a very large area within Tropical Storm Malakas, indicating the storm had a good amount of energy powering it. 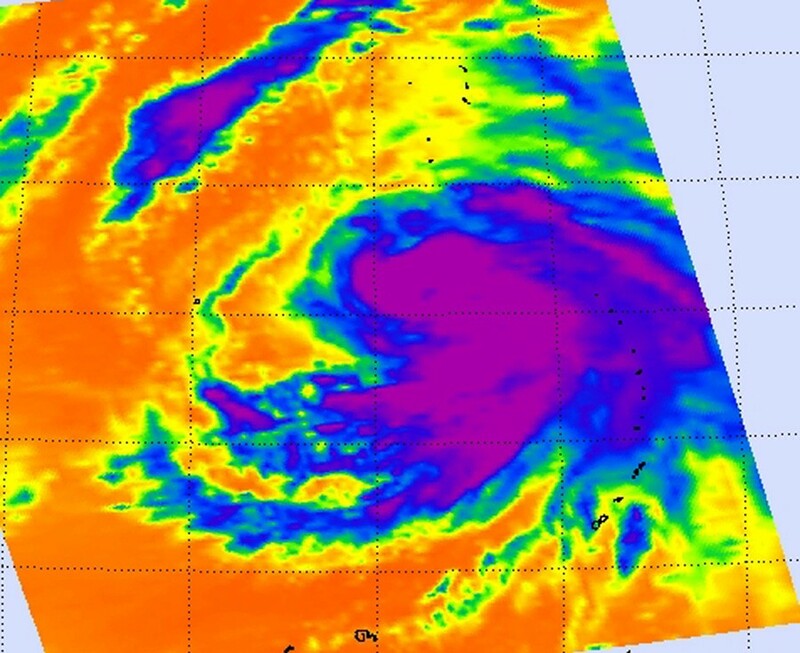 Infrared imagery also showed an eye with thunderstorms banding around it (circling it), and convection (and thunderstorms) re-building over the system, which indicates strengthening. The center of Malakas is forecast to be closest to the island of Iwo To at 0000 UTC (about 9 a.m. Local time) on Sept. 24 (8 p.m. EDT on Sept. 23).